First Impression: Newport is often viewed (to the consternation of Cincinnati city officials) as Cincinnati's leading entertainment district. Right across the Ohio River and walking distance from both Downtown and Covington, this neighborhood offers an incredible array of dining, shopping and nightlife options. The modernity of new developments, such as the shopping district along the river is nicely balanced with the preservation of historic buildings, such as those in the East Row. Central, accessible and with something for everyone, Newport is a popular destination for people of all ages. Second Look: Newport enjoys a certain degree of infamy. Once known as "Sin City" for its many casinos on Monmouth (followed later by strip clubs) and its mobster history, Newport had long held a spot in people's minds as a somewhat unscrupulous place to have a good time. In the 1980-90s the city of Newport decided to remake its image as more family-friendly, and began new developments with that in mind - such as the impressive Newport Aquarium, opened in 1999, which hosts 70 exhibits and 14 galleries. Newport on the Levee, the prime shopping and entertainment district, features 40 businesses, including restaurants of all cuisines, a movie theatre, a comedy club and many specialized shops. At this point, though there are a few scattered "gentlemen's clubs" still hanging on, unless you are specifically looking for adult entertainment, the city has been successful in transforming its "Sin City" reputation as a place to have good, clean fun. Newport's residential options range from expensive historic estates to bargain fix-em-uppers, to newer developments such as Middle Earth lofts and SouthShore Condominiums. There is a mix of everything from section 8 housing to luxury riverfront high-rises - which contributes to a highly mixed populace. 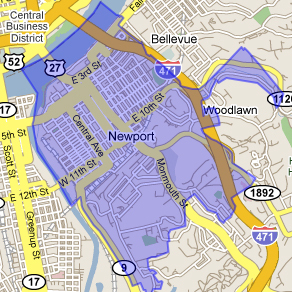 Though known primarily as an entertainment zone, Newport is home to around 17,000 residents. Beyond the riverfront and Newport on the Levee, Newport has a much older, small-town feel, with mom and pop diners and small independent shops.